Which school are you in? It’s a subject all parents obsess about: schools. How few good ones there are and how to get their children into them. The International Baccalaureate (IB) or the Indian School Certificate Examinations (ICSE)? How to make it to South Mumbai’s Cathedral & John Connon School (Maureen’s Head Start playschool is the way), or Campion, or J.B. Petit School. Or, should you just skip those traditional schools that are stressful, competitive and ramshackle and opt instead for that growing set of new schools which come with an “international" tag? There are plenty of options: The number of Indian schools offering the University of Cambridge International Examinations (CIE) has grown by three times in as many years to almost 200, while 37 outfits offer the IB programme. 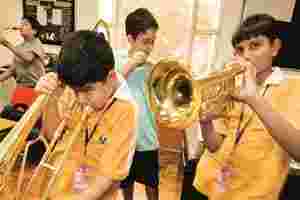 At the conveniently located École Mondiale World School at Juhu, there are few open spaces. But the classrooms are large, the corridors eye-catching and the laboratories gleaming (as parents will tell you, they allow nail polish and don’t insist on braided hair and, oh my god, what parties those kids have). At Dhirubhai Ambani International School in Bandra, one of the few international schools you can’t really chequebook your way into, the academic pressure is intense. Parents may complain that teachers aren’t accessible enough or that the no-preference-to-siblings policy is family unfriendly, but it’s a glamorous school to be in. David Beckham’s coaches fly down to take a football camp, Amjad Ali Khan visits to play music while director Shekhar Kapur sends Elizabeth’s costumes for a study lesson in English social history. Similarly, at the American Schools, you can visit Vienna to play as part of the school orchestra or opt for stimulating subject combinations such as mathematics, rock climbing and robotics. Most of this, though, comes at a price: International schools charge anything between Rs3 lakh and Rs10 lakh a year. At an average cost of Rs3,500 per school day, this is five-star education indeed, without the slog and swot of the national boards. But is it worth it? Or is it just the easier way out? As Narayana Murthy of Infosys once said, he sent his son to Cornell because he couldn’t make it into IIT and many of these swanky imports do just that— provide good education alternatives for children who find it tough to get into traditional schools. Students usually find themselves in the red either because they are foreign-returned and enter the school system halfway through the academic year or because their performance in Hindi and other subjects doesn’t make the grade. Indus International (which looks like the Bangalore version of the White House), with its sprawling 40-acre campus, swimming pools and riding range, was a good choice for India-returned Intel analyst Aarti Rao. “I could speak to my daughter Sanjana’s teacher anytime on her mobile, even during school hours," says Rao. Sanjana has since moved, but Indus International, Rao says, made the transition to India easier. Regular schools, with their crowds, chips and cracks, are like roadside India. Withstand the Indian schooling system and you’re set to tackle anything, as scores of successful immigrants will testify. Which is why London-returned Kavitha Rao ran the rounds of regular school admissions and her eight-year-old daughter Maya spent many hours cramming for entrance tests for admission to Mumbai’s J.B. Petit School. “You have more options if you put your children in a regular school," she says. “How, by studying in an international school, will your child be prepared to socialize with ordinary Indians? All the kids in such schools are NRIs or foreigners or from very wealthy families who think nothing of shelling out Rs7 lakh a year." So, even though her children’s school fees are totally reimbursable by the multinational bank husband Sanjeev works for, Kavitha is happy for her kids to have a sturdier schooling experience. Like Kavitha and Sanjeev, many parents stay away from international schools. Singapore International is starting with just five to seven students per class, Billabong International in Santacruz, Mumbai, has two per class in secondary school and École Mondiale has around 15 students per class. A few kilometres away from École is the 30-year-old Jamnabai Narsee School. Here, the kids eat their lunch standing around corridors or sitting down on the school grounds. There’s no air conditioning and the children have to learn a lot of stuff by heart, including their tables. But the waiting list to get into this institution is long and legendary. It’s a demand imbalance that could simply be due to the fee factor: École is about Rs8 lakh a year while traditional schools are in the range of Rs30,000-60,000 per year. Plus, many take issue with the five-star qualities of next-gen schools. As a parent, you could side with Shujaat Khan, managing director at Blue River Capital. Khan points out that infrastructure in Indian schools, as in the rest of the country, must improve. The VC fund manager, whose children are all set to go to École Mondiale, says: “I know people say it is good for the kids to rough it out, but if somebody told me to rough it out at an office that doesn’t have an AC or has broken windows, I wouldn’t." And finally, which is the better curriculum? IB/IGCSE or CBSE/ICSE? IB maybe the trendiest acronym in academics today, but it’s questionable whether the Geneva-based IB-trained kids can easily move to Indian colleges. After an IB, it’s difficult to get into the traditional college system and, indeed, almost all IB graduates go abroad. But IB converts say it’s project-based learning over “spit and rote". Entrepreneur and investor Mahesh Murthy and poet wife Manisha Lakhe’s son Agni goes to the Cambridge IGCSE-affiliated Billabong International School in Mumbai. “He wants to go to school on Sunday," says Lakhe, explaining how stimulating studies can be. Agrees journalist Sunita Wadekar Bhargava, whose son Saahil studies in Class VIII at the city’s American International School: “They learn integers and decimals through following the share prices of four stocks over three months, and now Saahil knows his numbers perfectly." Says an enthusiastic Saahil: “We do a lot of group projects. I did research on Wikipedia and made a PowerPoint on Amerigo Vespucci when we were studying European explorers; it was fun and my teacher loved it." Still, IB can get a little too international. Shalini Advani was principal of the British School, New Delhi, but her daughter Keya studied at the traditional Sardar Patel Vidyalaya: “If you are Indian, you need to study Indian history in your growing years; you need to do Hindi seriously." IB schools study world geography and history. And the international school curriculum is far removed from the realities of competitive exams. For IIT-minded students such as Ishaan Sethi of DPS R.K. Puram, these schools don’t cut much ice. “It looks like a resort," he complains of a Gurgaon-based international school which he visited during an inter-school match. The Class XI student prefers his own school. “The faculty is very academically-oriented," he explains. “We used to keep complaining about our class tests, but when it’s the end of February and your exams are two weeks away, you are so glad you had those monthly tests. Everything’s easy and at your fingertips." Traditional schools have these strengths, especially progressive ones such as Shri Ram and Sanskriti in New Delhi, Besant Montessori in Mumbai and Krishnamurthy Foundation’s “The School" in Chennai. And they don’t have to be frogs in the well. As Advani points out: “A good solid Indian school looks outward. It has its own way of being international." 1. How much would you be willing to pay for your child’s education? 2. Would you like to send your child abroad after 10+2? 3. Do you feel competition helps children do better? 4. Do you feel discomfort (such as lack of an AC) is good for kids? 5. What do you value the most? Mostly ‘a’s—You are very mainstream. Stick to the tried and tested traditional schools. Mostly ‘b’s—You are somewhat more flexible and open to trying either option. Mostly ‘c’s—You are inclined to the next-gen international. Go for it—you certainly have a great choice of schools.